In a mixer fitted with a paddle attachment, cream sugar and oil until smooth (5-7 minutes). Add eggs one at a time, beating well after each addition. Add remainder of ingredients, making sure to stop and scrap down the sides of the bowl. Turn into prepared muffin cups, heart shaped baking pans, or mini-bundt pans. Bake for 20-25 minutes or until a toothpick inserted in the centre of the cake comes out clean. Allow to cool and remove from pans. Makes 30 cakelettes. 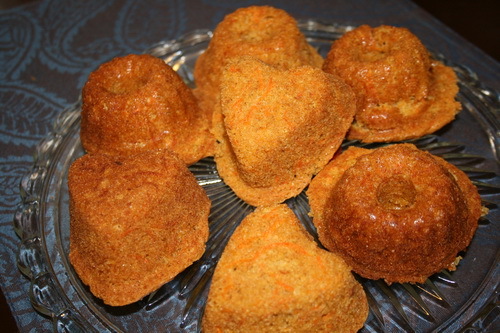 Now, when you’re working with something like shredded carrots and intricate molds such as the mini-bundts, there will be some cakelettes that simply will not loosen and come out in one piece. Have no fear, do what any good chef would do — Improvise! 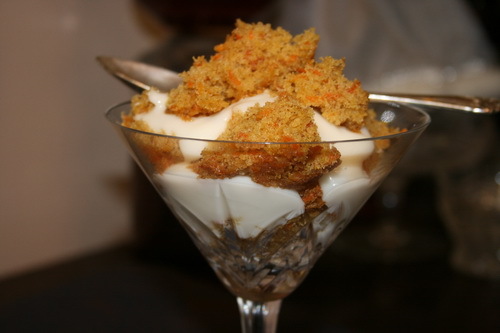 Layered in a martini glass with sugar free, fat free vanilla yogurt, this makes for an elegant and tasty trifle. And no one need know this was a “mistake”!